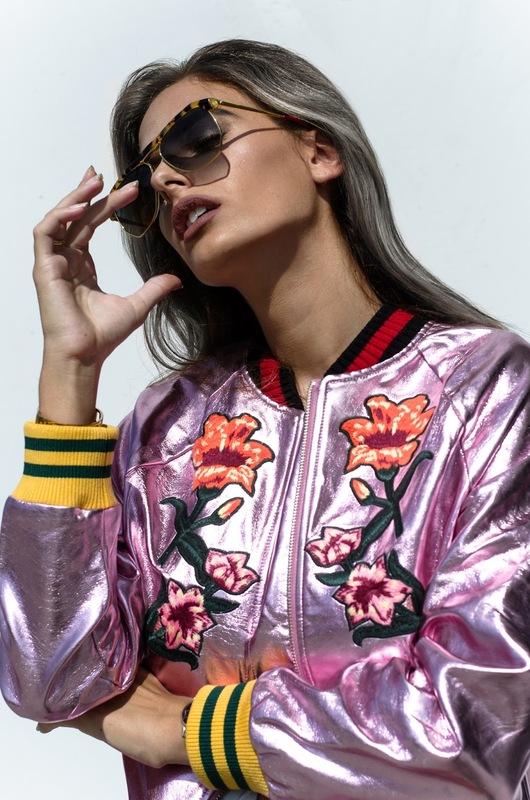 I love this pink metallic jacket. It is so cool and it can lighten up any outfit any time. I wore it with a silk white top and button leather skirt. These sunglasses make this outfit even more cool. They are from Sheriff and Cherry and this model is called Miami (it totally is, right). I took these photos with my friend Filip Koludrovic and I love how he edited them. How do you think this grey hair style looks on me? Ideja outfit-a mi se mnogo svidja, ali kombinacije pojedinacno i ne puno. . . . Such a cool girl boss!! Awesome outfit! you look amazing in this jacket..